Have you ever been followed around the internet by that pair of running shoes you’ve been eyeballing or had Verizon Wireless offer you $200 to join them after you’ve been to their site? That’s remarketing! And, believe it or not, it’s pretty effective. Google has published a ton of case studies on how it can help increase conversions, and we’ve seen the benefits as PPC managers at DTC. But how do you know if it’ll be a successful strategy for your business? 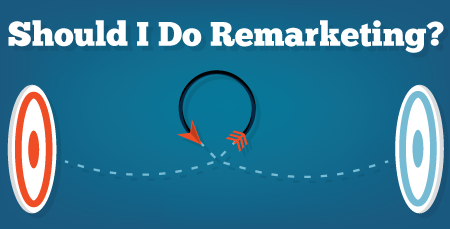 Why Should I Do Remarketing? It’s almost always a good idea to have some kind of remarketing in play. Think about it. I’m willing to bet you shop online from time to time – or always – and what do you do? Do you buy the first item you see, OR do you shop around for a bit and do some price or feature comparison? I’m willing to bet you do the latter, and most online advertisers know this. And let’s face it, unless something about your site is extremely memorable or you have a powerful brand, chances are shoppers are going to forget your offer after seeing a few more sites offering the same product or service. There is good news, however. You can – and should – start collecting cookies and remarket the crap out of visitors to your site. People don’t spend their time on the internet doing searches on Google. Think about where they are: they’re reading the latest news or wasting time at work on BuzzFeed – something I’ve never done, personally… With remarketing you can reach users while they’re browsing the internet on Google’s Display Network. If they visit your site on a mobile device, you can also retarget them on their favorite apps. Another reason to do remarketing is presence. One of the benefits of advertising on a display network is the high volume of impressions your ads will get. On the other hand, one of the drawbacks to that is your ad is eligible to show to anyone on any website that sells ad space. With remarketing, you mitigate some of that risk by limiting your impressions to only the people who’ve visited your site. As a result, chances are your connection to that user will be more meaningful. You can take it a step further and move your remarketing strategy into warp speed by creating audiences based on specific pages and demographic info (with Google Analytics remarketing). With Dynamic Remarketing, you can also show ads to previous visitors with specific information based on your type of business – for example, product information if you’re in retail or flight information if you’re a travel planner. Simply put, if someone visits your site and doesn’t convert, you want them to remember you in case they’re shopping around. Remarketing is also great because, since it typically works on a cost per click model, you are staying in front of a potential customer- but if they’re not interested in your offer, they will simply ignore your ad and you are not paying for that exposure. However, if they do click on your ad, you have just re-engaged them further along the sales cycle. At the end of the day, remarketing is a low-risk way to reconnect with customers since they have already expressed interest by just visiting your site! Previous Previous post: What Is The Most Expensive Keyword To Bid On? Next Next post: How Do You Measure the Success of a Viral Piece?